Why Should You Have an Above Ground Pool Deck? An above ground pool deck can dramatically change the look and use of your above ground pool. 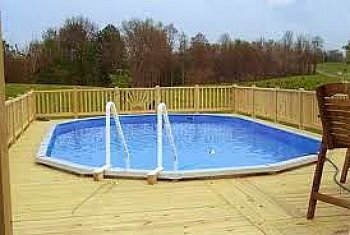 While it is not an absolute requirement, a pool deck will greatly enhance the usability of your pool. Above ground pools are very popular for good reasons. They are affordable, easy to install, and require little maintenance. But, they come with inherent downsides as well. First, getting into the pool requires getting from ground level up to pool level, and second, there is not a poolside area to relax and do the things that people do beside their pools. Another consideration regarding above ground pools - they aren't particularly attractive just sitting out in the yard. They tend to have an "unfinished" appearance. An above ground pool deck can help you to resolve all of these issues. A well designed above ground pool deck can transform your pool into a more attractive and more usable backyard feature. You can blend the pool into the rest of your backyard design and create a usable area around the pool for poolside activities. You will also keep your pool cleaner since there will be less dirt and debris tracked into the pool from the surrounding yard. Before you make decisions about the particular size and style for your above ground pool deck, take time to study the area around your pool. Hopefully, you were careful with your site selection when you installed the pool. If you haven't put up the pool yet, plan carefully before you do. Obviously the pool site has to be flat and level. How about the area around the pool? Consider the slope and grade of the ground near the pool. That will play an important part in the design and cost of your pool deck. Check the direction of the sun during the time of the year when you will be using the pool. Shade and sun are both important parts of an enjoyable pool experience. You can create the shade if you need to - the sun is a lot trickier! How about privacy? Again, you can create barriers if you need to, but why not take advantage of natural privacy screens or ones that are already in place? Finally, as with every other piece in your overall backyard design - be sure your pool deck design works well with the rest of your plan. Do you want the pool deck attached to your house or existing deck, or will it be freestanding? Do you just want a place to get into and out of the pool, or are you looking for a design to blend in with the rest of your backyard design planning? Visualize your desired end result, and sketch it out on paper. Be sure to leave room for future components as you plan. Choose your deck builder wisely. In central North Carolina, we recommend Camino Construction. They are simply the best in the area. Honesty, integrity, and high quality workmanship make them the right choice for anyone. 1) A Platform - If all you want is a place to get into and out of the pool, a simple platform will work. There will be steps from the ground up to a small platform, with enough room for a couple of people to stand. 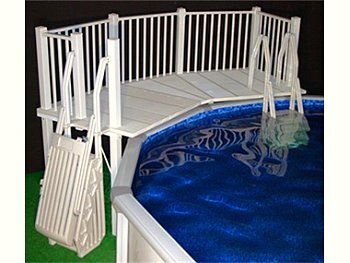 A pool ladder provides access from the pool back onto the platform. This style provides safe access, but that's about it. You may have room for a small table for towels, a radio, sunglasses and the like, but no room for any poolside activities. You may say that a simple two way ladder accomplishes the same thing, but consider safety. Entry and exit are easier and safer if you have a place to stand before moving on, rather than trying to turn around at the top of a ladder. And if anyone in the pool ever has a problem, aid can be provided much more effectively from a platform. There are prefabricated platform kits available that can have you "up and running" quickly, or you can build your own. There are also add-on sections of platform that can expand your usable space around the pool. If you add a few sections, you begin to move into the next style of pool decking. 2) Partial Surround - If you want more than just a small access platform, consider a partial surround style deck. Maybe the far side of your pool won't get used much, or there may be other reasons you don't want or need the poolside area there. Build a deck that surrounds part of the pool and leave the rest as is. Maybe you can't afford to build all the deck you want for now. That's okay, just plan and design for the rest later. This doesn't have to be an "all or nothing" situation. Maybe you have plans for other backyard features to come and a full deck would interfere with future plans. Whatever the reason, a partial surround deck gives you plenty of room to enjoy your pool. 3) Full Surround - If you have the space and the budget, wrap a deck all the way around your above ground pool. Just like the much more expensive in ground pools, you'll be able to walk all the way around your pool. You can move to which ever side the sun is on, or the side with the shade if you prefer. 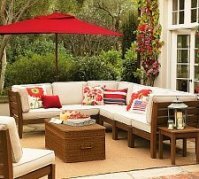 Tables and chairs, loungers, umbrellas, all sorts of outdoor furniture can be added. Pool cleaning and maintenance becomes easier. 4) Integrated Deck Design - For the ultimate above ground pool deck, tie it into the rest of your backyard design. 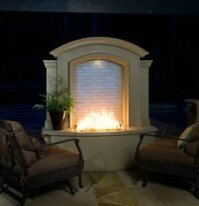 This can take on many forms, depending on what other backyard features you have or plan to have. Connect your pool deck to your existing deck or patio. Provide access to and from your house without having to walk through the yard. Maybe you'd like an outdoor kitchen next to the pool for the ultimate pool party. 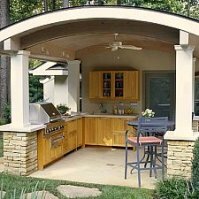 A covered porch or gazebo provides a great place to gather for a break from the sun, or to sit down for lunch. With creative designing and thoughtful planning there is usually a way to combine multiple features so they can be enjoyed together. You will need some form of railing around your above ground pool deck, regardless of the style. There are lots of deck railing options as well. You should also have a gate to keep children and other uninvited or unsupervised people out of your pool. This is a must for safety and liability reasons and many jurisdictions require it. I recommend slip resistant material on your stair treads, and don't forget - the stairs themselves can add interest and appeal if designed and built properly. 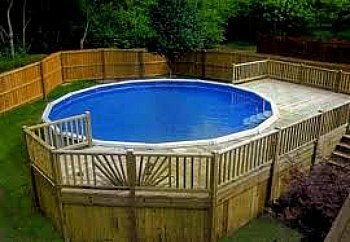 If your deck fits over the edge of your pool, be sure to sand the exposed edge of the boards to prevent splinters. If you tuck the deck boards under the lip of your pool, splinters will be less of an issue. Remember that there will be lots of bare feet walking on your deck, so make sure the surface is smooth. Depending on the materials you use, there may be other concerns related to specific materials. Be sure to check out our deck materials page before you buy materials. Add some well thought out landscaping, deck lighting, and maybe some lattice panels, and you'll have the envy of the neighborhood. If you want to tackle this yourself, be sure you have the skills you'll need. 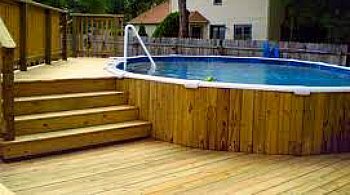 Due to the varies angles and shapes, an above ground pool deck is usually more difficult to build than a standard deck.